If you’re pregnant, many things and questions cross your mind as you look to fulfill the natural instinct of keeping your baby completely safe and healthy…. What kind of food can I eat? Can I go in the hot tub? Is caffeine okay? What about smoking and alcohol? Can I fly? Can I exercise? What about what touches my belly? Are some pants too tight? In that case, what about seat belts in the car? Although, we’d love to answer all these questions for you right here and now, we’ll focus on the last one for now. So…. What about seatbelts in the car anyway? Protecting life and the use of seat belts go hand in hand. Therefore, pregnancy and seat belts go hand in hand as well. Is it safe to wear a seatbelt when pregnant? Yes. It is 3x safer to wear a seat belt than not. Additionally, it’s required by law. This is true whether you’re sitting in the front or the back seat. You can only travel without a seat belt if you have a medical reason for doing so and a certificate to prove it. You should also know that’s it’s always safer to use a lap belt and shoulder strap. How should I wear the seat belt? 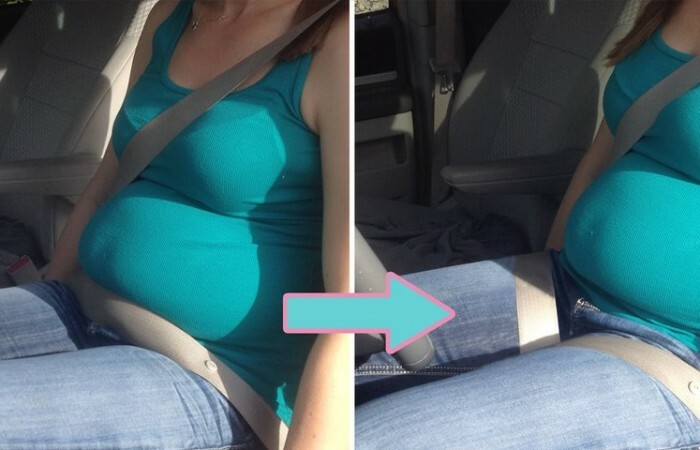 You should wear the seat belt low across your thighs and hips and under your baby bump. If you were to position the belt on your belly, the pressure from it could cause injury to the placenta and hurt your sweet baby if you were in a crash. Additional tips for wearing your seatbelt when pregnant: – pull upward on shoulder belt to make belt snug – lay shoulder belt between breasts – if driving, tilt steering wheel upwards – keep vehicle seat upright instead of reclining as if reclining, the seatbelt could push on uterus in a crash. – slide front seat as far back as possible as to sit farther away from the air bag. How can I be sure I’m wearing the seat belt properly without worrying about it? For optimum protection, get yourself a Tummy Shield. Tummy Shields are devices that redirect the seat belt off the pregnant abdomen to create a leg harness (much like a race car driver’s) to offer mom and baby protection and comfort. For more ways to ensure a safe ride for kids, check out this blog.